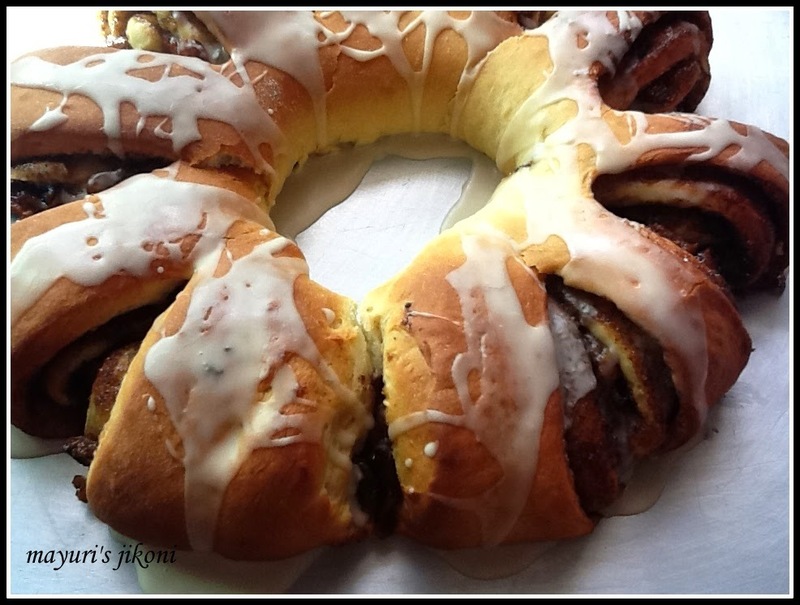 What is a Swedish tea ring? Its a sweet pastry/ bread traditionally served during Christmas as a tea time treat or for breakfast. Thus the name tea ring. Its very much like the cinnamon buns but this tea ring is shaped into a wreath. The filling can vary from nuts to dried fruits and different spices. When Gayathri the initiator of the Baking Eggless group sent the recipe as the challenge for this month, I took one look at the picture and thought, that it would be complicated. It actually is not and its fun to make different shapes with yeast dough. I will be certainly making this recipe again and again as the tea ring was absolutely delicious. Perhaps I felt that way because I love cinnamon. I baked the ring when my niece and her family were visiting. Her daughter, my grand niece, had it again the next day as dessert. Normally, its easier to substitute eggs in a yeast dough, as adding a bit more milk or yogurt does the trick. However, this time I decided to try some other substitute which I had read on the web, water, baking powder and oil. Also increased the amount of yeast. Eggs in a bread acts as a leavening agent therefore making the bread rise high. The yolk helps to tenderize the crumbs making the overall bread less dense. It also helps to make a structured loaf. I am glad I used the combination of water, baking powder and oil as it made the bread appear less dense. Mix water, oil and baking powder in a small bowl. Sift flour. Add sugar, salt and yeast and mix well. Add the baking powder mixture to the milk. Form a dough using the milk mixture. Knead the dough for 10 to 15 minutes till it is soft and smooth. Cover the dough with cling film. Place it in a warm place to ferment till it is double the size. It will take about 1½ – 2 hours. Mix cinnamon powder, sugar and raisins together in a bowl. Keep it on the side till required. Sift powdered sugar into a bowl. Add extract and milk and mix it. Grease a baking tray with butter or line it with parchment paper. Gently knead the fermented dough. Dust your work top with flour. Roll the dough into a rectangle 12 X 16 inches. Smear the butter all over the rectangle. Sprinkle the filling all over the rectangle. Roll up the rectangle from the widest part like a swiss roll or jelly roll. Pinch the edges to seal well. Place the rolled up dough on the baking tray and shape it into a ring. Pinch the ends to close up the ring. Using a pair of scissors, cut ⅔ of the way. Be careful not to cut all the way. Make these cuts at an interval of one inch. Turn each section gently, on its side. Cover the ring and let it the dough rise again for about 40 to 45 minutes. Place the baking tray in the hot oven. Bake for 20 to 25 minutes till the top is golden brown. Remove the ring from the oven. Drizzle the top with the icing and let it cool down a bit. Serve with a hot cup of tea or coffee. If you like, you can make 2 rings. Divide the filling and butter equally. If the top browns too quickly, cover the bread with an aluminium foil. Using ¾ cup sugar made the ring a bit too sweet. I would prefer to use less next time. You can sprinkle chopped nuts, candied peel, dry fruit on top after icing it. Don’t be in a hurry to remove the bread from the tray. Let it cool down a bit before you do that. One big ring was a bit difficult to handle.I would try 2 rings next time. After the first ferment, can leave the dough in the fridge if you want to bake it for breakfast. Such a beautiful Swedish tea rings, well done. nicely done bread, wish i can bake like this.